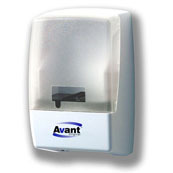 Hand Sanitizer Dispenser - Tempo Safety Compliance & Supply, Inc.
Touch free wall dispenser is a rugged and reliable dispenser for use with 1000 ml refill bags or a 1400 ml refillable container. Touch free activation prevents cross contamination making it ideal for healthcare, corporate, educational and industrial applications. - Motion activation prevents transfer of pathogens from one user to the next. - Patented design tested for over 1 million hand washes.